There are billions of recipes for skin care everywhere. Sometimes it's really overwhelming knowing which recipe really works or which is best for our skin. I, myself, have tried so many different DIY homemade recipes and products for my skin, I kind of feel bad for it. But I have just found the perfect ingredient that fits every skin type and even everyone's budget. This magic ingredient is the cucumber! Cucumbers have so many minerals that bring dozens of benefits to the skin, hydrating, moisturizing and revitalizing all at once. I'll share three different recipes that include this genius ingredient: a face mask for dry skin, a face mask for oily skin, and a very healthy cooling beverage. Blend the cucumber and stir the honey and the lemon juice. Apply the paste on your clean face with your hands. Let it dry for 30 minutes and rinse with warm water. Apply moisturizer for extra hydration. This recipe will nourish and refresh the skin, balancing the hydration. Cut the cucumber into little cubes. Blend with the mint leaves, while whisking the egg white separately. When it's ready, add the egg white to the mix and blend again. When it's all mixed, apply the paste on your face and neck with your fingertips. Leave in for 20 minutes and rinse with cold water. The mint leaves will have very refreshing and revitalizing benefits, while the egg white will balance the level of oil in your skin. 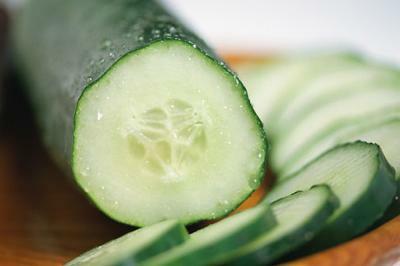 Cut the cucumber into small slices and place into a jar of cool water. Break the rosemary and mint leaves into small pieces and place into the water. Let it cool in the refrigerator for 30 minutes. It's important to be hydrated from the inside as well, and this recipe will make sure it happens.